Video clip comes hot on the heels of leaked pictures showing Aston's new twelve-cylinder roadster. Seeing the new Aston Martin V12 Vantage Roadster pop up unannounced last week was a pleasant surprise. But to see it out and about in London already was a further unexpected thrill. The twelve-cylinder convertible is tipped to be limited to 101 units, but given how quick Aston was to integrate the &apos;Limited Edition&apos; coupe into its model line, there&apos;s every chance the roadster could become a permanent addition to the Vantage line if demand keeps up. 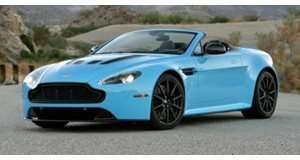 The V12 Vantage Roadster packs the same 6.0-liter V12 as the existing coupe, packing 510 horsepower and 420 lb-ft of torque for a top speed of almost 190 mph and a 0-60 time of 4.2 seconds. The V12 model also receives a revised trunk lid with rear spoiler, carbon-fiber side strakes and mirror caps, new forged alloys, and specific exhaust pipes. Aston also modified the V12 Vantage&apos;s suspension in order to handle the added weight of the folding soft top and structural reinforcement. Thanks to excellent work from supercar hunters Alex Penfold and Munch977, we have been given the chance to see the brand-new model, sporting a gloss white exterior with deep-red carbon-fiber elements and red interior, driving through London&apos;s swanky Mayfair district en route to an official photo shoot. We&apos;re keeping our eyes peeled for Aston Martin to release official photos and specs, so watch this space for more.